One of the most eagerly anticipated advancements in cycling technology is finally here with the SRAM Red eTap Wireless Electronic Groupset. This wireless system removes any unnecessary clutter to leave just the elegant essentials and an electronic groupset that is ready to tackle any road. With well over 500,000 miles of testing, including multiple Grand Tours, the RED eTap is reliable and smooth to use. The system connects via SRAM's proprietary AIREA wireless protocol. This uses an incredibly secure 128-bit encryption system, similar to the one used by cash point machines, so security is not an issue. The eTap has one of the most intuitive shifting systems ever created, with each lever either shifting up or down and not both. The right lever shifts up and the left down, while pressing both levers at the same time shifts the front derailleur. This system makes accidental shifting a thing of the past. 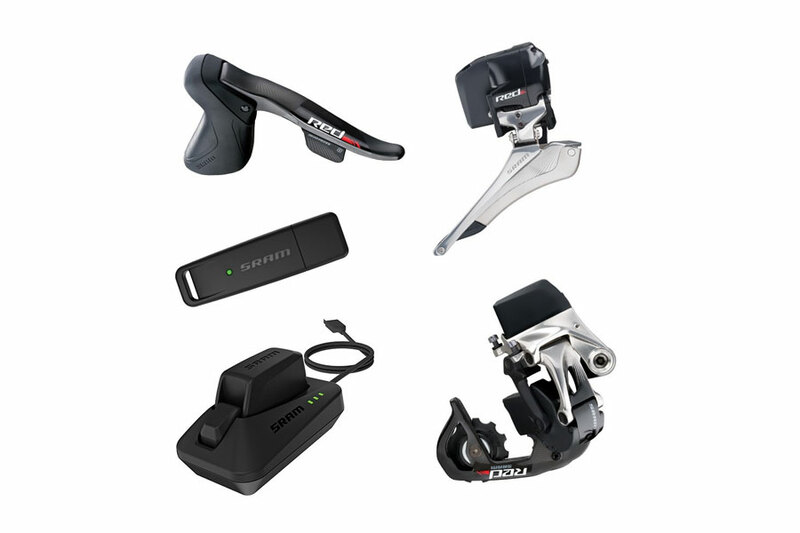 SRAM's redesigned Ergofit levers seamlessly connect you to the bike and the ReachAdjust hoods fit any hand size or shape. Carbon ErgoBlade levers provide ergonomic and tactile shifting, so your hand doesn't slip or get caught. An effortless and instant shift is made possible with the RED eTap rear derailleur. Unbelievably easy to set up, the mechanical properties such as the carbon pulley cage, ceramic pulley bearing and high polish alloy, blend perfectly with the proprietary electronic system. At just 215 grams, without the battery, this derailleur still maintains a very slim profile and the medium cage fits a 28t maximum sprocket. The front derailleur continues the lightweight theme, at just 163 grams without the battery. Working seamlessly with the wireless protocol, this derailleur utilises SRAM's cutting-edge YAW technology that makes automatic adjustments throughout the gear range without the need for a rider's input. SRAM's RED eTap system is compatible with all SRAM 22 cranksets, chains, chainrings, brakes and cassettes and the IP67 standard means it is both dust and water tight when submerged to a depth of 1 metre for 30 minutes. Both the front and rear derailleur batteries are included. These batteries are interchangeable and provide up to 1000 kilometres of riding per charge. The included USB battery recharger brings the batteries up to capacity in just 45 minutes and the system automatically powers up or goes into sleep mode when the bike is either moving or stationary. Finally, the USB dongle allows you to easily update the system's firmware from your computer.